There's a little magic in the air each fall: leaves turning golden and misty fog transforming our seaside town. Magic also happens here at the Phoenix when we invite our graduates to return and present their own work as part of our season. Alumni find themselves in the halls, misty-eyed and nostalgic, and ready to share wonderful advice and stories about their experiences in the working world of theatre. Our current students get excited and inspired; working along side alum, making connections and learning about the exciting career paths their degree can take them in. Such is the magic happening the department this past week as our students learn what lies on the other side of the wardrobe. Read on for more about this year's Spotlight on Alumni and related events, and updates from our many other graduates. “It feels like coming full circle," says alumna Kaitlin Williams (BFA'09). Ten years ago, Kaitlin met Mack Gordon (BFA '08) when they were two fresh-faced first-year students in the Department of Theatre. Now married, they return to the stages of the Phoenix Theatre for our Spotlight on Alumni with The Lion, the Witch and the Wardrobe, running October 9-18, 2014. "Kaitlin and I are blessed to work together as often as we do,” says Mack. 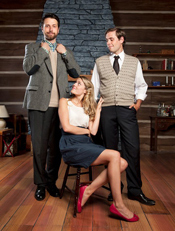 In 2012, they were cast as Peter and Lucy in Pacific Theatre’s much-loved adaptation of C.S. Lewis’ classic Narnia tale. Written and published in 1950 by C.S. Lewis, this novel is the first and most well-known story in the Chronicles of Narnia series. Ron Reed, the Artistic Director of Pacific Theatre, adapted The Lion, the Witch and the Wardrobe for the stage, setting the play years later when Peter and Lucy are adults. Stopping off to tour their Uncle Digory's house they find themselves returning to the same spare room where the old wardrobe sits and begin to recount all the adventures they had as children. Their imaginations take over: using only the furniture in the room and a few old coats from the wardrobe, they travel back to Narnia—bringing the audience along with them. 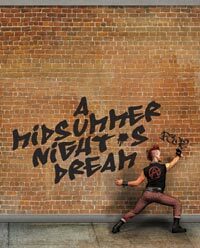 A seasonal favourite, Pacific Theatre has remounted this play many times to great acclaim since it first played in 1998. Over the past few years, Kaitlin and Mack have toured this show across the province sharing the clasic story with many BC communities, including stops at Kamloops' Western Canada Theatre, West Vancouver's Kay Meek Centre and, of course, the play's home: Pacific Theatre. This presentation at the Phoenix Theatre brings the play to Vancouver Island for the first time. Not many of us get to bring our spouses to work, but for Kaitlin and Mack, acting together makes their careers more rewarding. 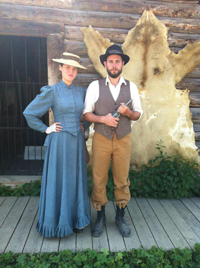 They keep an eye out for projects where they can perform together, whether it’s playing fiancés in the Jessie-winning production of The Foreigner (shown above with John Voth) or Mr. Jake and Nellie Webster, a gold miner and his wife at Barkerville Historic Town (shown below). “We joke that we are a 2-for-1 package,” laughs Kaitlin. Having their show selected as the Spotlight on Alumni presentation this year also means an opportunity to share post-graduating advice with current students. “Our comprehensive education helped get us involved in many areas of theatre, not just acting. The skills and connections we gained – whether backstage, studying marketing, working in the box office, or collaborating with community groups – have kept us working in theatre over the years,” says Kaitlin. Both actors have busy and multi-faceted careers that provide what they call their “patchwork pay cheque.” Mack is an actor for theatre, film, and TV and also writes his own plays, works as a director (he recently assisted director Meg Roe (BFA ’04) at Bard on the Beach, shown left) and does simulation acting for training purposes. Kaitlin has performed on stages around Vancouver and was also the Community Engagement Manager for Pacific Theatre, where she began right after university as an apprentice. She now finds acting takes up all her time. For Kaitlin especially, this show is close to her heart. As a 12-year old girl, she attended Pacific Theatre’s adaptation of The Lion, the Witch and the Wardrobe and watching the actors transform into the story’s various characters – from Mr. Tumnus and the Beaver, to the evil White Witch and the mighty lion Aslan – inspired Kaitlin to become an actor herself. 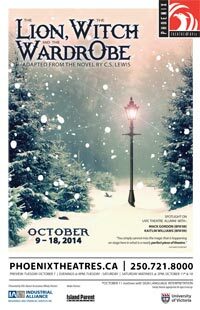 NOTE: If you're planning to attend The Lion, the Witch and the Wardrobe, take a look at our entire season. For the regular ticket price of just two plays you could attend all four plays by subscribing to the entire season for only $48. Or, choose just three plays for only $36. Adapted from the much-loved novel by C.S. Lewis, join Lucy and Peter as they return the to the attic where their magical adventures began and relive the memories of their magical adventure. Preview tickets available only after 5pm on peformance day. Performance will be followed by a talkback session with the actors. Before the show, join professor Jan Wood in discussion with alumni Kaitlin Williams and Mack Gordon about their careers in theatre together. * We're pleased to offer sign language interpretation by Nigel Howard and Nicole Pedneault for our Deaf and Hard of Hearing community. Box Office is open for single tickets now. Three or four show subscription packages for only $36 or $48 still available. Rm A240, Human & Social Development Blg. Free lecture with the award-winning author, journalist, playwright, screenwriter and Theatre/ Writing alumni about the changing nature of humour, incorporating not only his own experiences, but also a critical examination of what is funny in the 21st century. 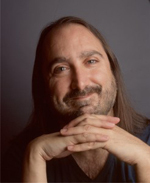 Mark is the 2014 Harvey Stevenson Southam Lecturer in Journalism and Nonfiction and the author of the Stephen Leacock Medal for Humour for his memoir "Never Shoot a Stampeed Queen" which he has since been adapted for the stage. Shakespeare's classic romantic comedy get's a fun edgy spin when it's set in the underground punker culture of Greenwich Village in the late 1970s. Box Office opens for single tickets on October 28. Three or four show subscription packages for only $36 or $48 available now. Our alumni were involved with lots of exciting events this summer. The new movie “The F Word” was released to theatres across North America this summer. Based on our Mike Rinaldi (BFA ’96) and TJ Dawe’s (BFA ’97) play Toothpaste and Cigars, it stars Daniel Radcliffe and Zoe Kazan and was featured at the 2013 Toronto Film Festival. Congratulations you two! The Gabriola Theatre Festival and it's Festival Director Alina Cerminara (BFA ’12) (shown right, in 20s theme from the festival brochure) included many Phoenix alumni productions this year: Lucas Myers (BFA ’95) with PilotCopilot Theatre; Clayton Jevne (BFA '85, MFA '87 and PhD '03) with Theatre Inconnu; Chelsea Haberlin (BFA ’07), Amitai Marmorstein (BFA ’07) and Sebastien Archibald (BFA ’07) with ITSAZOO Productions; students Molison Farmer, Kaeden Derksen, Hayley Garnett, Samantha Lynch, Francis Melling and alumna Kathleen O’Reilly (BFA ’14) with Kerploding Theatre; and Cameron Fraser (BFA ’11) with Break/Contemporary Circus. Phoenixers once again had a great showing at the Victoria Fringe Festival with more than 40 graduates and current students in over a dozen shows. 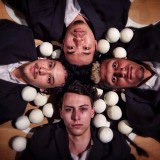 Many accolades to current student Sean Brossard, who won the Pick-of-the-Fringe award for his show The New Conformity, which blended circus art and theatre to create an exciting new experience. Always great to see so many alumni back in town during this time of year. Matthew Payne (BFA ’96), the Artistic Producer of Theatre SKAM premiered the brand new Pop-Up Theatre at Rifflandia 2014, bringing very short miniplays to festival-goers in an innovative theatre that travels on the back of SKAM’s Mobile Performance Venue (a renovated pick-up truck). There were a couple of fantastic alumni announcements this summer. 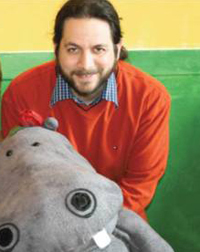 Congratulations to Pablo Felices-Luna, (BFA ’96) (shown right) who was this summer appointed Artistic Director for the Manitoba Theatre for Young People. Previously, Pablo was the Artistic Director of Carousel Players in St. Catharines, Ontario. UVic’s Department of Writing announced that this year’s Southam Lecturer is Mark Leiren-Young (BFA ’85), the hysterically funny author, journalist, playwright, screenwriter, and actor who is a grad of both the Theatre and Writing programs at UVic. As part of this appointment, Mark will be giving a lecture about the nature of humour called "You Can't Say That! Comedy, Censorship & Sensitivity" (More information in calendar above.) If you miss his lecture, watch for Mark around town and around campus this year —he’ll probably be wearing a 1980s’ Phoenix shirt! This fall, the Victoria Theatre Guild presents a plethora of Phoenixers on stage. Langham Court Theatre’s production of Pride and Prejudice, October 2-18 includes theatre grads from then and now including Ian Case (BFA ’91) (in photo left in Green), Katt Campbell (BFA '08), Danielle Florence (BFA ’14), Ian Simms (BFA ’14), Melissa Taylor (BFA ’14) (in photo left in red) and Paul Terry (BFA ’89) join current students, Chase Hiebert, Ellen Law and Keshia Palm on stage in this adaptation by also alum Janet Munsil (BFA ’89). 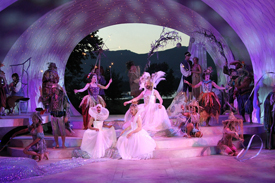 The show was also designed by alumna by Carolyn Mitic (BFA' 05). Wow! And if you missed it this past summer, Hayley McCurdy (BFA ’14) and Tea Siskin (BFA ’14) wowed in the hit Langham show Boeing Boeing! Also coming up, you can see current students Alexa Carriere, Tim Martin, and recent grad Tristan Bacon (BFA ’14) in the Peninsula Player’s The Mousetrap at Berwick House Theatre (October 24-26) and Charlie White Theatre (November 1-2). Watch for Chari Arespacochaga, this year’s Directing MFA candidate, when she does a stint at the Belfry Theatre as Assistant Director for their production of Venus in Fur before she returns to the Phoenix to direct Amadeus this spring. 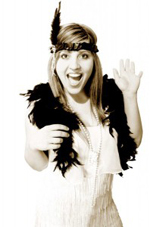 How old was alumna Kaitlin Williams when she was inspired to become an actor? Email your answers before October 18 to be entered into a draw for our next show! Thanks also to our supporters from the Cadboro Bay Village including: For Good Measure, Heart Pharmacy, Pepper's Foods, Smugglers Cove Pub and Dr. Amanda Weinerman Optometry Clinic.